Hair loss with men and women most commonly occurs with inherited balding (androgenic hair loss). Aging with men and women may encourage balding individually. Genetic hair loss is caused by the male hormone Dehydrotestosterone affecting the hair follicles to accelerate the regular growth cycles of hair. This results in miniaturization causing the cease of hair follicle lately. 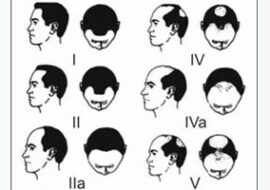 The typical male pattern for hair loss is being categorized by the Norword Scale and follows a receding hairline advancing to the mid scalp and the crown. Furthermore hair loss may be caused by inflammation, accidents or several diseases. 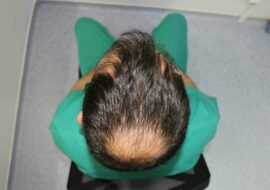 Hair transplant at the HLC will only be performed on patients with inherited balding and cannot successfully be performed on patients suffering from pathological balding. Are there any pre-operative instructions I have to follow? Every patient of the HLC will be instructed by our consultation team prior to the procedure via phone or email about every aspect to be considered for the hair transplant. When you arrive at the clinic you will undergo a thorough medical investigation including a blood test. We kindly ask every of our patients to tell about their medical history and necessary medications to be taken. Possibly some of the medications will need to be suspended for the surgery. For healthy reasons our clinic wants to avoid allergies and unnecessary reactions. Our medical team are taking greatest care to minimise any risks and avoid unforseen consequences. The maximum time for every procedure will depend on the patient´s predisposition and the amount of grafts (hair follicles) needed. Patients with progressive balding will necessarily ask for a higher amount of grafts. As every step of the procedure at the HLC is manually and precisely performed without any use of motorized punches the maximum number of grafts to be relocated per day will reach about 1500-1800. This involves a daily procedure of about 8-10 hours. Patients with higher demands up to 3000 grafts will require two more daily sessions. As for patients arriving from abroad we kindly advise for a minimum stay of about 4 days. The whole hair transplant procedure will be performed under local anaesthesia. This means the patient will not feel any pain throughout the whole process. Many patients of the HLC are pleasantly surprised how little discomfort they feel when our surgeon injects the numbing agent in the scalp area. After the extraction process you will be allowed to sit back and relax or have lunchtime. 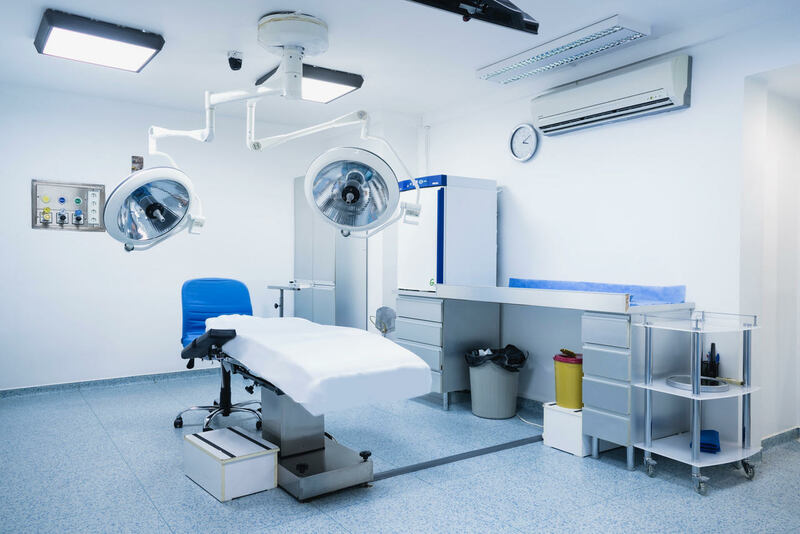 For the relocation process our team will use local anaesthesia again to make you feel comfortable and expect no pain during the whole procedure while you are allowed to watch a movie or listen to your preferred music. Does the head need to be fully shaven for hair transplant? For regular hair transplant via FUE we kindly ask every patient for a full shaving of the scalp including the donor area and the recipient site. However the HLC appreciates the personal needs and circumstances of patients asking for discretion and willing to migrate back to social life instantly. Therefore the HLC offers hair transplants without shaving the recipient site. As this method is more labour-intensive and time-consuming the rates for part-shaving hair transplants will be higher than those for regular procedures. What is the transection rate at the HLC? Unfortunatly some of the hair follicles will be damaged during the extraction process in case the physician does not have the necessary experience and precision needed. Sometimes hair follicles offer a complicated position and may not easily be extracted by the manual punch. Furthermore some hair surgeons are using wrong or older medical tools / devices for the removal of the grafts. This often involves a damage of the individual follicle respectively the hair bulb. Our medical team will use all their artistic skills to delicately perform expert hair transplants with one of the lowest transection rates in the business. As with untalented physicians rates of 20 to 30 % are regular the HLC has an average yield of about 1 % only. How long will it take for the new grafts to grow? Most of the patients will initially expierence some shedding at the recipient site following a regular process after hair transplantations. Transplanted hair will resume growing after 3 months with most of the patients. As this may vary form the patient´s individual predisposition only a few or more hair follicles will be seen growing at this time. The final result of a hair transplant will not be expected before 8-12 months post surgery. During this time a number of patients are experiencing some emotional distress since not only shedding but some (temporary) shock-loss of residual hair may individually downgrade the visual appearance of the patient. Furthermore a lot of patients are unaware of the fact they have been wearing longer hair prior to the hair transplant. We emphatically ask our patients for indulgence and patience during these 8-12 months of expectations since our team will not be able to judge the results of the hair transplant earlier. When will I be able to go back to work post transplant? As for FUE representing a minimally invasive method for hair transplant the recovery time is shorter than with any other methods. Scabs can take up to a week to fall off und some reddening at the recipient site might occur for a while. The HLC kindly asks every patient to wait for at least 10 days before going back to work again. The healing process will be longer risking the success of the hair transplant in case patients want to migrate back to social activities earlier. Depending on the physical requirements of the patient´s work we ask to avoid heavy activities and sweating during the first week. Those who do not care about scabs or a shaven head and who will not be involved with strenouus work can feel free to instantly go back to work after transplant. Are the any instructions post surgery I have to follow? The HLC team will give you personal instructions after the hair transplant procedure. This also includes antibiotics to be taken and shampoo to be used for head washing. Those patients wearing a cap or hat should avoid initial pressure during the first two weeks. In case you don't care too much about your appreance in public you might be able to go back to work very soon. We kindly recommend to not go in for sports and to avoid sweating during the first 4 weeks post transplant. In case of persisting swelling you may use some medication being issued by the HLC team post transplant or ask us. Sunburn at the recipient site should be avoided for the first months. In case you immediately like to travel to a country with strong sunlight we kindly recommend you to wear a cab or hat. Will hair restoration last for a lifetime? How long will my new hair grow? Successfully transplanted donor hair will achieve the same characteristics in length, calibre or colour as before. Scalp hair tends to grow endlessly which means it will match with pre-existing hair at the recipient-site and does not show any difference. Other than that bodyhair (BHT-Bodyhairtransplant) is not finally proven to fully achieve the same characteristics as scalp hair at the recipient-site. Bodyhair has shown varying results on patients and will not be used for the receding hairline. I have only little donor supply. Can I use other kind of hair for hair transplant? 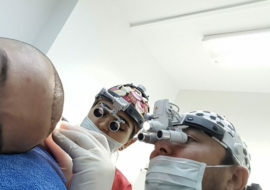 Unfortunately only the patient's own scalp hair can be used for hair transplant. As for extensive baldness patients with a Norwood 7 grade will not qualify for hair transplant since there is not abundant hair supply available. Those with little donor supply may consider bodyhair-transplant (BHT) in case there is sufficient beard or chest-hair available. Are there any visible scars occurring after hair transplant? Unlike older methods for hair transplant such as Strip Surgery the state-of-the-art technique FUE allows for a minimally invasive hair restoration process. During the extraction process a manual punch (FUE-extractor) between 0,8 to 1,0 mm will be used to delicately remove the hair follicles from the donor area. HLC will investigate the patient´s donor site prior to the procedure to allow a wider range of hair distribution and minimise the risk of any scaring. As with FUE no visible scars will be left behind this method currently features the gold-standard for hair transplant worldwide.